Miss you, Little Sis! The season is winding down. The tourist families are gone, of course, though thank goodness the snowbirds haven’t taken flight yet! Our little art collective’s been a big hit its first summer. Thanks again for suggesting the name– “Snowberry Gallery” is perfect! With business slowing, I’ve been able to get out and paint quite a bit. Did I tell you I started silk painting? Such a great medium–like watercolor, only with French dyes and silk instead of paint and paper. The colors are so vibrant! I’m sending you a shot of my latest–a birch grove. Eager for your opinion. Fresca loves it, but she’s such a mom–she loves everything we do. Which reminds me of Nick. Our handsome brother showed up unannounced and stayed just long enough to say hello and do his laundry, then headed back to the woods. I think that broken engagement is harder on him than he’s letting on. Wendy Fontaine’s new bakery is tres yummy–although if I were her, I’d have opened in time for Memorial Day, not Labor Day. But you know Wendy–try to tell her what to do and you might as well take a knife to your own throat. But her croissants and eclairs–ooh la la! And Max is such a doll, and so supportive. Landon sends kisses. His preschool class took a tour of the fire station today, and now he wants a big red truck of his own. This weekend, we’re taking him down to Caldwell Guest Lodge for a ride on that old pump truck. Of course, Jason will want to pull the alarm bell himself. Boys and their toys! I hope you’re knocking ‘em dead in Seattle, little sis, ‘cuz I wish you were still here! (My author, Leslie Budewitz, is delighted to report that our first book now has a title: Death al Dente! Cross your fingers that my little sister Erin will be back in Jewel Bay in time for its debut in summer 2013. 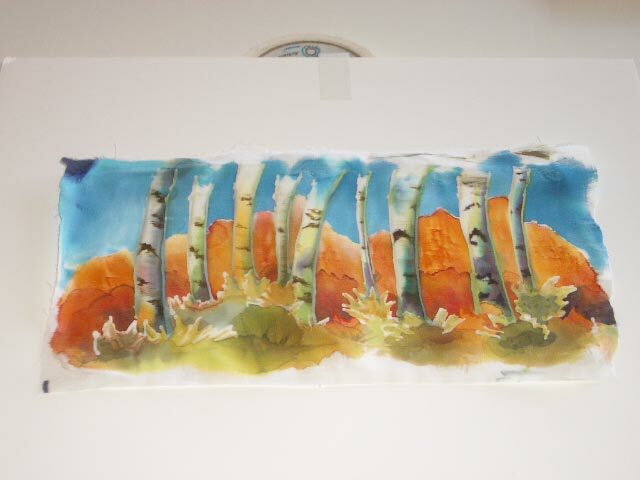 I love the birch grove on silk painting! Silk is such an elegant 'canvas', isn't it? What are you going to do with it? Sounds like such a creative village -- would love to visit some time! Willow, what a sweet invitation! I bet Threadville is stunning this time of year. Victoria, since it's my first, I'll probably hang it in my studio, but you and Lizzie can look for more silk paintings in the gallery soon! Come on out! What a lovely sister. And talented, too! I love the name of the book. Very clever! Thanks, Krista! At first, I wasn't so sure about our author -- exposing our little town to prying eyes -- but I'm starting to like her!